Temp started at 75, cloudy and windy. At end, temp was 93, sunny and windy. Hike began across the road (FM2288) from the park's North Shore entrance. Go through the gate and follow the dirt road/path until the end. Turn around and return along the same route. I suggest you pull up Google Earth and look at the satellite photos (as of this writing dated Mar 2015). The trail is easy to see as it runs along the North Concho river, which is mostly dry at this time. The "trail" is an old dirt road which at points, narrows to a path, before widening out again. There are no trail markers and maintenance is minimal (IMO). The main reason I like this hike is simply to see the birds. The North Concho River runs through this area and the trail somewhat parallels the river. 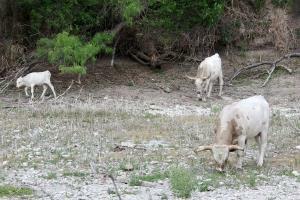 Bear in mind, the area is in a multi-year drought; major portions of the river are DRY. Nonetheless, there are patches of water along the river and that is where the bird activity is. Great Blue Herons, various raptors, as well as different songbirds, can be seen if you're patient. Today, I saw Vermillions Flycatchers, a Painted Bunting, lots of smaller, less colorful birds, a few hawks and a Caracara - the second I've seen in all my time at the park. The park's cattle were there in abundant numbers as well; numerous calves with both parents present. First and foremost - if you want to hike in this area, check with park personnel beforehand as this area is used extensively for hunting at various times of the year - even if the rest of the park doesn't allow hunting. Private land borders this area so always know where you are and do not trepass!!! Water, shade, info kiosk and toilets available at the North Shore gatehouse where you will park your vehicle.